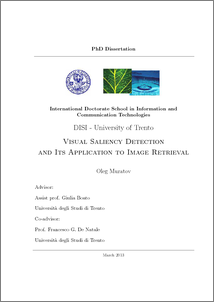 Muratov, Oleg (2013) Visual Saliency Detection and its Application to Image Retrieval. PhD thesis, University of Trento. People perceive any kind of information with different level of attention and involvement. It is due to the way how our brain functions, redundancy and importance of the perceived data. This work deals with visual information, in particular with images. Image analysis and processing is often requires running computationally expensive algorithms. The knowledge of which part of an image is important over other parts allows for reduction of data to be processed. Besides computational cost a broad variety of applications, including image compression, quality assessment, adaptive content display and rendering, can benefit from this kind of information. The development of an accurate visual importance estimation method may bring a useful tool for image processing domain and that is the main goal for this work. In the following two novel approaches to saliency detection are presented. In comparison to previous works in this field the proposed approaches tackles saliency estimation on the object-wise level. In addition, one of the proposed approach solves saliency detection problem through modelling 3-D spatial relationships between objects in a scene. Moreover, a novel idea of the application of saliency to diversification of image retrieval results is presented.